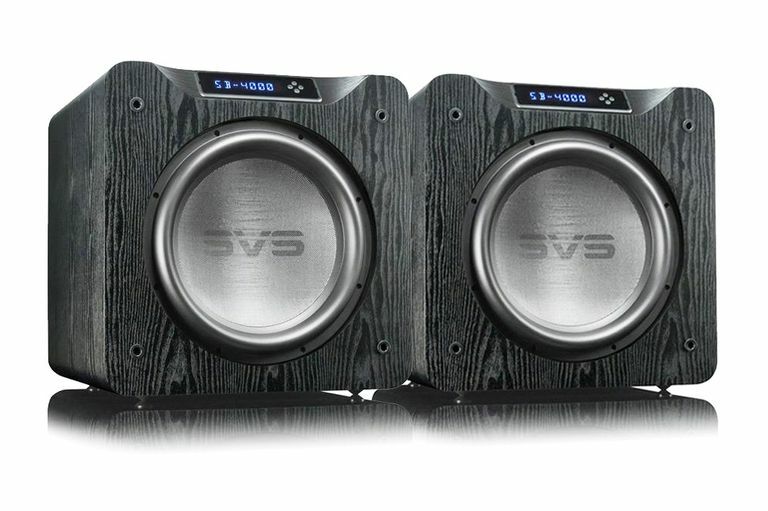 SVS SV-4000 Dual Subwoofer Option. Subwoofers are definitely an important component in a home theater system, providing the knock-your-socks-off low-frequency effects impact for all those sci-fi and action movies, as well as the low frequencies from acoustic and electric bass, and even kettle drums, from those jazz, rock, and symphonic albums. In surround sound, the subwoofer is assigned to its own dedicated channel (that is where the .1 comes from in 5.1, 7.1 etc...). It is also referred to as the LFE (Low-Frequency Effects) channel. However, just because you have included a subwoofer in your home theater setup, that doesn't mean you are getting all the bass impact you need or want. If you have a large room, a room that has acoustical problems, or an irregularly shaped room, you may find that you need more than one subwoofer. However, before you consider adding a second subwoofer (or even more), make sure you have performed some basic room placement and bass management setting tasks to see if you are getting the best performance out the subwoofer you already have. After working with the subwoofer and room that you have, if you find that you need, or want, more than one subwoofer, the question then becomes: "How do I hook-up two, or more, subwoofers in my home theater system?" The main thing you need to know about integrating more than one subwoofer into a home theater setup is that if you are going to use multiple subwoofers in your listening area, it is best to use all of the same brand and model, so as to have the same low-frequency reproduction profile for your room. However, with some added attention, you can combine two different size subwoofers, such as a larger 12-inch sub with a smaller 10 or 8-inch sub, or subwoofers of different brands and models. In these cases, in addition to the differing size of the subwoofers, as well as their frequency ranges, you have to be aware of any differences in power output. Now, before you buy your subwoofers (or combine ones that you may already have), make sure they provide the connections that can fit within the three possible setup options below. If you have a home theater receiver that only has one subwoofer preamp output (sometimes labeled Pre-Out, Sub Out, LFE, or Subwoofer Out), just use an RCA Y-Adapter and use it to send two parallel low-frequency audio signals to two separate subwoofers. If your home theater receiver has two subwoofer outputs, connect one of the outputs to one subwoofer and the second one to another subwoofer. If one of your subwoofers has both an RCA Line-in and Line out connection option, you can opt to connect your home theater receiver's subwoofer pre-out to your subwoofer's line in, and then connect the subwoofer's line out to the line-in of a second subwoofer. If you are planning to use three or four subwoofers, the best option would be to make sure all your subwoofers have either RCA line or LFE line out connections and just daisy chain them all together using a series of subwoofer cables. If that is not possible, you may need a home theater receiver that has two subwoofer preamp outputs that you will have to split so that you can feed up to four subwoofers. As you can imagine that means a lot more cables. There is one additional subwoofer connection trick that you can take advantage of (and it isn't that expensive). Sunfire and Velodyne and other select manufacturers make wireless subwoofer adapters that are able to transmit subwoofer audio signals to up to two or four wireless compatible subwoofers, respectively. In this case, stick with Velodyne or Sunfire wireless subs if possible, but both systems can adapt any subwoofer with RCA line inputs into a wireless sub. When considering wireless subwoofer kit options other than Sunfire and Velodyne, check the manufacturer's specifications or user guide to make sure that the wireless transmitter will work with more than one compatible wireless subwoofer or wireless receiver connected to a wired subwoofer. No matter if you opt to use just one subwoofer or decide to take advantage of using two or more to get the best bass coverage for your room, regardless of the brand, model, size, and connection option(s) of the subwoofers, you still need to find the best spot in your room for each one that will provide the best performance of each one and all of them together. To accomplish this be prepared to do a lot listening and moving, along with making setting adjustments to get the best result for your room and listening preference. The considerations and options discussed above are designed to be used with standard powered subwoofers, if you are using passive subwoofers, in addition to the subwoofers, you will need an additional separate external amplifier(s) to power each passive subwoofer. Buying multiple subs and setting them up to get the best result can be an expensive and time-consuming project. If you don't think you are up to the task of doing this yourself - consult a home theater dealer/installer to come out an evaluate your room and current setup to see if you really need multiple subs to get the best bass performance. Which Type of Subwoofer Is Right for You?